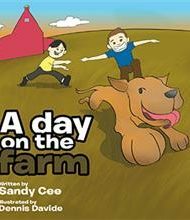 Sandy Cee’s children’s picture book tells of the adventure two boys experience when they spend a day on a farm. A Day on the Farm spells out the experiences of Andy and Ben, who visit Andy’s uncle’s farm to help out with chores. When their task of taking a dog called Zoey for a run in the hills goes awry – with Zoey becoming stuck in a rabbit hole – the boys get Andy’s uncle’s help and the dog is happily released by story’s end. While readers might expect from the title to learn about the day-to-day life on a farm, the story is completely centered on the tale of the dog’s mishap. The writing is spare (“Uncle Frank picked up Andy and Ben from Andy’s house”), with illustrations that are serviceable, although somewhat flat and mostly featuring wide-open spaces and big blocks of color. On the first page and back cover of the book, the author explains that she is recounting one of her late husband’s stories. “The way he told the stories was very funny and always made me laugh,” she writes. Unfortunately, such humor is never realized on these pages, and readers might wish for a more lively telling. Even the scenes that offer the most potential for action and emotion are written with workaday words as in: “The rabbit was scared when Zoey chased it. The rabbit ran down its hole to get away from Zoey.” The result is a story that never fully engages its audience. The mission of saving a loved one’s stories for posterity has merit, and youngsters may take comfort in the simplicity of this story. But the tale would be more effective with revision with an eye to capturing elements of the original that made the story memorable and funny. Livelier word choice and a demonstration of comic timing would help to win a wider audience of tots and their book-buying parents.